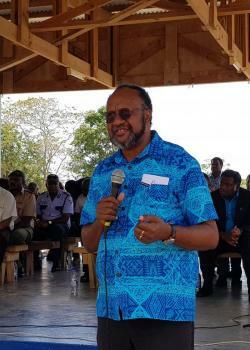 The Vanuatu Council of Ministers has decided during its meeting Thursday to repatriate over 11,000 people of Ambae to their island and villages. The repatriation will depend on the logisltic plan prepared by the National Disaster Management Office (NDMO). The COM has also agreed to extend the state of emergency to facilitate the repatriation. Vanuatu Government will be responsible for the repatriation of Ambae people back to their home island. Before the COM convened, an NDMO assessment team was on Ambae to make observation and report to the government if it is safe for the displaced families to return home. Amidst the ongoing relief efforts and food distributions, the Daily Post understands that by Thursday, all clusters should have finalised and submitted their sectoral plans for repatriation. Meanwhile, Prime Minister Charlot Salwai, will be travelling to Santo, Pentecost and Maewo to visit the evacuees. According to the Public Relations Officer (PRO), Hilaire Bule, the PM will be accompanied by a high level delegation consisting of President Moses Obed, the Minister of climate Change, Ham Lini, Minister of Internal Affairs Alfred Maoh, MPs from Ambae, President of the Penama Provincial Government Council (PPGC), President and representatives of Malvatumauri Council of Chiefs, Director and Acting Director of NDMO, Acting Director of Vanuatu Meteorology and Geohazards Department (VMGD), Commission and Acting Police Commissioner. “The delegation will be conferring words of appreciation on behalf of the government to the host communities on these three islands for accepting and looking after all evacuees. “This will be an important ceremony for the government and all the people concerned from Ambae and host islands,” said the PRO. The Secretary General (SG) of the Penama Provincial Government Council, Georgewin Garae, also confirmed the repatriation process to begin soon.